In Brazil, this style acquired a typical flavor, with fortuitous touches of rhythmic cells characteristic of the Samba! Brazilian creativity and mixtures also gave birth to many styles, such as Samba Funk, Instrumental Soul Jazz, Samba Soul Jazz and derivations like Dance, Disco, Rap, Regional Swing followed. In Brazil, the diffusion of these styles took place from mid 60s till today! 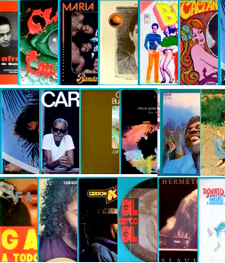 In Brazil, some artists who represent the Soul, Funk, Groove Brasil are: Tim Maia, Jorge Ben (Benjor), Gerson King Combo, Getúlio Cortes, Banda União Black, Carlos Dafé, Édson & Aloísio, Banda Black Rio, Antônio Adolfo, Roberto Carlos, Bebeto, Lenine, Antônio Carlos & Jocafi, Ed Motta, Trio Mocotó, Obina Shok, Funk Como Le Gusta, Os Mulheres Negras, Nonato Buzar, Marku Ribas, Marcelo, Cátia de França, Ângelo Antônio, A Turma da Pilantrália, Trio Ternura, Tony Tornado, Carlinhos Queirós & Soninha Queirós, Sandra de Sá, Macao, Cassiano, Grupo Táxi, Os Diagonais, Brilho, Cláudio Zoli, Hyldon, Azymuth, Fábio, Paulo Diniz etc.